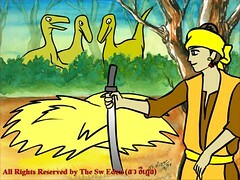 ♥ <<Previous Part "Arrive the Forest"
After King Tabin comes down from the dinosaur’s back, he walk straightly into the forest. 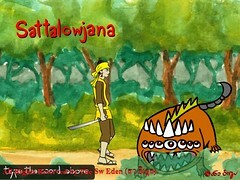 At the first stage of the adventure scene, King Tabin meets four different beasts, and the user will see the hint that they have to use keyboard to type things in. The first beast is “Sattalowjana” or the grasshopper in the bible. 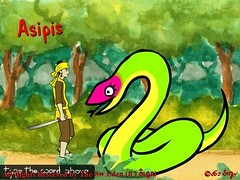 The second beast is “Asipis”, she is the female great serpent. 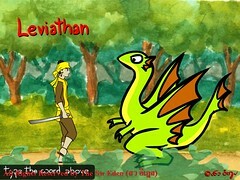 The third beast is “Leviathan”, which is also the creature in the bible. 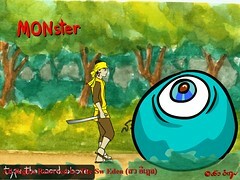 The forth beast is “MONster”, which refers to half-blood Mon people. Oh! 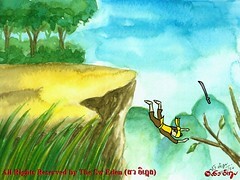 King Tabin accidentally falls down from the cliff. 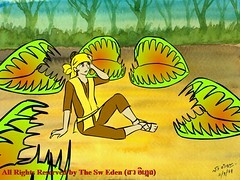 He found himself sitting among the giant Venus flytraps, which is so dangerous for him. The user needs to help him close the mouth of Venus flytraps. The hint in this part is the red line flashing around the object that the user needs to click or drag and drop. Firstly, the user drags the sword to one of the Venus flytrap, and when the sword hit-test-object, the sword will cut that Venus flytraps into 5 pieces. The user will drag each of those 5 pieces into the other Venus flytrap, so it will close the mouth. When all Venus flytraps close the mouth, the red flashing hint will be around the sword again. When the user starts dragging the sword, the flashing hint will be around King Tabin, this mean the user will drag the sword to King Tabin. After he gets his sword, he will stand and go away from the bunch of Venus flytraps. Unfortunately, King Tabin just walks out from the bunch of Venus flytraps, but he meets 3 meat-eater dinosaurs, called, “Coelophysis”. He runs away and hides himself behind the tree. Currently, the user will create the trap for these meat-eater dinosaurs by drag and drop the object with red-flashing hint onto the ground. After the trap is created, the red-flashing hint will be on King Tabin. The user needs to click on him, so he will call the meat-eater dinosaurs. When they see King Tabin, they will jump out form the bush and fall into the trap.